A striking, narrowly upright plant that has dark, olive green, glossy foliage. 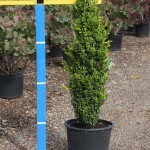 A good plant for tight spaces, narrow hedges, as an accent or focal point. Responds to pruning, but rarely required. It grows in full sun to some shade, in a well-drained soil.